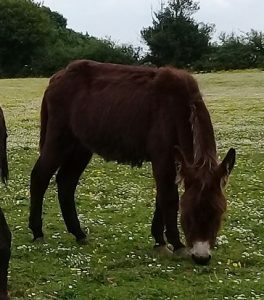 Abandoned in a school yard, after failing to be sold at a fair, Simon was suffering from rain scald, an infestation of lice, worms, etc and very overgrown hooves. We have estimated his age to be around 8yrs, he has now been gelded, chipped, etc. He is still getting use to being handled but has not displayed any nasty habits around people so we do not foresee any problems with helping him become easier to handle. If you would like more information on Simon please contact us for more details. At just 2 years of age Twiggy is a sweet young lady who is learning to become more trusting of humans. She arrived into our care with Simon after they were both left in a school yard when they were unsold at a fair. 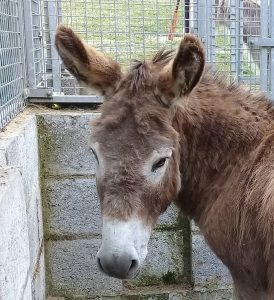 Twiggy is a taller donkey that still needs to build up some muscle but other than that she has recovered well physically. She has been microchipped, etc and so is now ready for rehoming. NB We do not allow any of our females to be used for breeding purposes. Abandoned in forestry, Sarge, arrived into our care in the summer of 2018 with overgrown hooves and showing signs of having had a hard winter. Thankfully he has recovered well and is now gelded, chipped, etc so is ready for rehoming. Sarge is still learning to trust people but from what we have seen with his progress continued handling will see him become fully confident and drop his fear barrier. If you would like more information on Sarge please contact us. Cria was completely underweight, had a huge lice infestation and had grossly overgrown hooves when arriving into our care in October 2016. 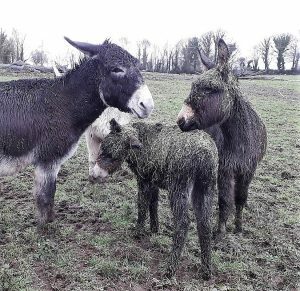 Her son, Eeyore, was approximately 6mths old. Slowly but surely Cria’s weight improved but her hooves will require ongoing monitoring due to the fact that the front grow incorrectly. They are both still a little unsure about placing full trust in humans so patience and a gentle approach will be required to help them learn they no longer have anything to fear. 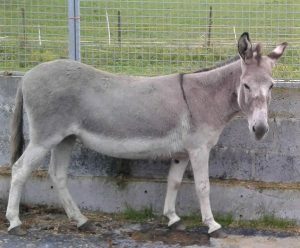 Eeyore has been gelded and both of them have been chipped & marked for passports. 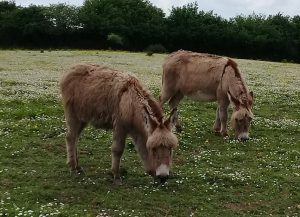 Despite there being plenty of other donkeys here that they could mix with they tend to stick together so they must be rehomed together. Marcie arrived into our care along with Mattie, her four month old son, and his father when their owner passed away at the end of 2017. 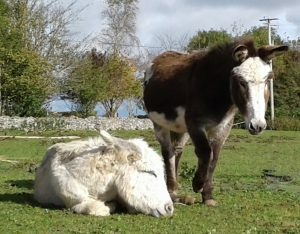 She was already in foal again and on the 4th of September last she gave birth to another son, Milo. As a mother, Marcie, has great patience and mental strength as on a daily basis Milo can be seen nipping at her, jumping on her and doing all other mischievous antics he can think of to see how far he can go before she tells him to stop. There are a lot of similarities in behaviour between Milo and his older brother Mattie (who is also looking for a home) so they can also be found exploring together without their mother. Marcie is microchipped, etc but as Milo is still a little young for gelding they would only be available for rehoming at the moment if the new owner agreed to have this done as soon as Milo is of age/ready. Just one year old since August, Mattie is a cute little lad. He is becoming more trusting of humans and with a bit more one to one contact he will make a perfect companion. Mattie has been gelded, microchipped, etc so is ready for rehoming. Marcie & Milo can either be rehomed as a pair or Mattie could go with them too. NB. We do not allow any of our females to be used for breeding purposes. 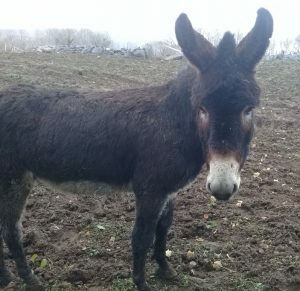 A sweet donkey who wants to be loved, Nora is approximately 8 years old. She was rescued from a very bad situation last winter but has thankfully made a full recovery physically. With a little more time and one to one attention she will become a loving companion. Nora has been microchipped, passported, etc and is ready for rehoming. 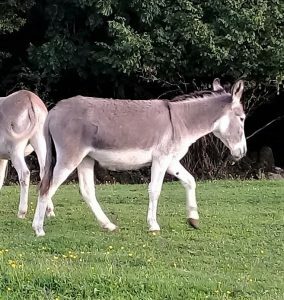 Hillary, approximately 8 years old, was wandering along a roadway visiting different farms with her son in late 2016 and no owner could be traced. 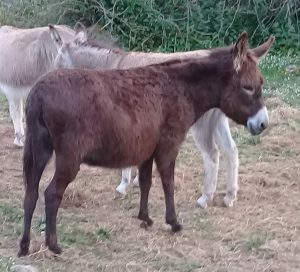 Upon arriving into our care both of them were quite nervous but soon a trust started to form and after her son had been gelded, microchipped, etc he found a new home with one of our other donkeys. Hillary remained in our care due to the fact that she was in foal. In April 2017 she gave birth to Florrie who unlike her mother was very curious about people and due to this she actually helped her mother become more trusting. 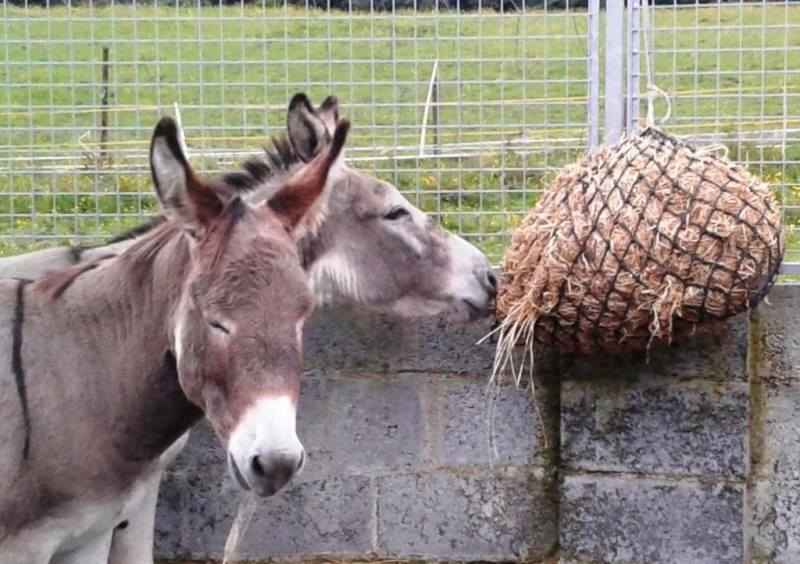 Hillary and Florrie are only available to be rehomed together. NB. As is the case for all our females neither Hillary or Florrie are to be used for breeding. Having always been a pair Ned & Nellie are looking for a home together. Nellie is the more forward and cheeky of this duo, she loves attention. Ned can be shy with people but his shyness is never evident at feeding time!! Ned has been gelded and both are wormed, chipped, etc so are ready for a new home.